I’ve often described myself as a political pessimist, if only because I’m skeptical of the power of politics as usual to resolve the multiple crises facing the nation and the world at large. I think significant upheavals and disruptions are likely. That having been said, I’m actually an optimist in terms of the longer trajectory: I do believe there is a moral arc that bends toward justice, and demographic changes will only hasten the arrival of a better system. Obviously, if you’re looking for bad news you can find it everywhere. It’s entirely possible we’re headed for a climate-ravaged corporatist dystopia of inequality that mirrors feudalism. Following a visit in March to Tacloban, the Philippine city devastated in 2012 by typhoon Haiyan, the pope will publish a rare encyclical on climate change and human ecology. Urging all Catholics to take action on moral and scientific grounds, the document will be sent to the world’s 5,000 Catholic bishops and 400,000 priests, who will distribute it to parishioners. According to Vatican insiders, Francis will meet other faith leaders and lobby politicians at the general assembly in New York in September, when countries will sign up to new anti-poverty and environmental goals. In recent months, the pope has argued for a radical new financial and economic system to avoid human inequality and ecological devastation. In October he told a meeting of Latin American and Asian landless peasants and other social movements: “An economic system centred on the god of money needs to plunder nature to sustain the frenetic rhythm of consumption that is inherent to it. Pope Francis was instrumental in helping achieve the normalization of relations with Cuba as well, and is helping to make The Vatican much more of a force for good in the world. Problems with women’s and other issues remain, of course, but the shift in tone and focus of the Church is frankly remarkable. If Pope Francis can remain healthy and use his power to ensure a likeminded successor takes his place when the time comes, it would be an enormous boost for social and environmental justice. It’s not just Pope Francis, either. It seems likely that a Socialist will make an at least semi-serious bid for the Presidency for the first time since Eugene Debs, and there’s a major movement to draft an explicitly anti-Wall Street liberal to make a serious run for President for the first time in decades. The Millennial generation is the most economically liberal since at least the Greatest Generation, which did not pair racial and gender equality alongside its economic liberalism. And in Europe, the anti-austerity movement continues to grow despite political missteps from various liberal parties. It’s not all bad news. The signs of a new moral majority are out there, providing reasons for optimism this holiday season. 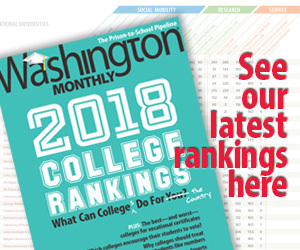 Help spread the good cheer by making a tax-deductible contribution to the Washington Monthly today!